Honey Bee Sting: Do you remember your first bowl of Pho? Do you remember your first bowl of Pho? Pho sure!... And I also remember my second. The first time was on accident. It was at least fifteen years ago in Pioneer Square, downtown Seattle. The small Vietnamese restaurant isn't even there anymore. I ordered what sounded like a delicious noodle soup, naturally it was cold and raining here in Seattle and it seemed the perfect thing to order. The owner of the restaurant was quite pleased that my friend and I had ordered this specific soup and began to bring out a tray of condiments to accompany our choice. Hoisin sauce, chili paste, a stalk of fresh basil leaves, fresh limes and bean sprouts. It was all quite exciting. When the soup arrived it was dark, brothy and beefy delicious and had the aroma of cinnamon, cilantro and onions. I didn't really think it needed messing with, but the owner was persistent to explain how pho works. 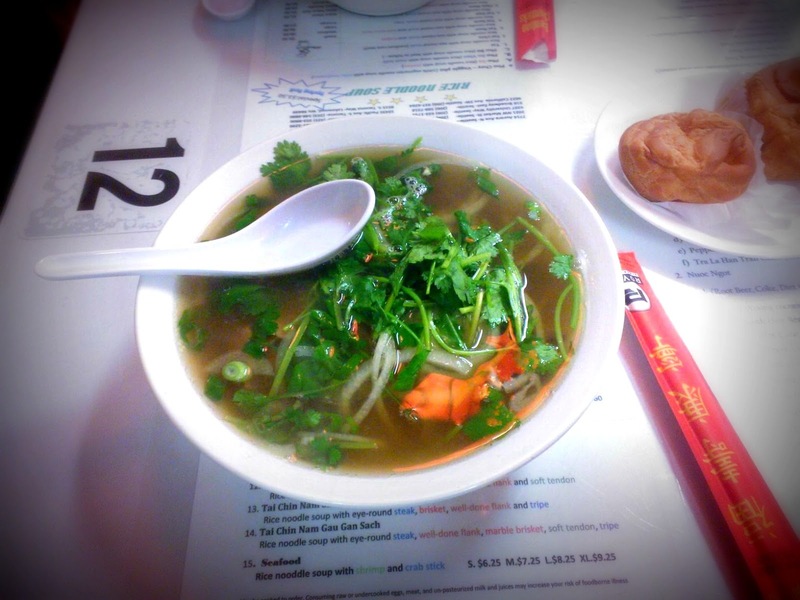 With smiles and enough hand gestures, together, my dining mate and I learned how to eat pho. Second time was a couple years later at the Than Brothers on Broadway. The main reason for going there was because I had heard it was so cheap. Being right out of college- eating something filling for $5 is worth seeking out. Plus, you know a place is going to be okay when they only serve one thing. The Than Brothers are also famous for their mini cream puffs they give you before your soup is delivered to your table, which if you have been to a pho restaurant recently, your soup comes out within a couple minutes of ordering it. This light and airy dessert before your meal is just an added bonus. Cream puffs, baguette Banh Mi sandwiches with pate and pho are actually all a major part of Vietnamese cuisine which we can attribute to French Colonists as far back as the 18th century. The base for pho soup is a consomme, a classic French style soup made clear by a clarifying process using aromatics, egg whites and usually a meat raft. A meat raft sounds pretty gross, but it's like a magnet, collecting impurities and particles in the broth and catching them all into one big aromatic meatball that is discarded once the broth is clear. If you think about it, there is quite the process to make quality pho. And now, I'm on a quest for just that. My husband loves the tripe and pig hearts you can get when you travel up north on 99. He asks the servers that he wants what they eat when they eat pho, something that's not on the menu. But it's not so much what's in the soup- I'll gladly take soft tendon, fatty flank and meatballs, it's really all about the broth for me. A trip to pho is never complete without a few un-phogettable puns and a reminder to wear your pho-jacket, as you will be wearing it's perfume long after you leave the restaurant. Feel like making it yourself? Here's a couple awesome recipes, one from Steamy Kitchen and another from Allrecipes.com. Bon Appetite Magazine's interview of Macklemore's love of pho and this incredible song by Sabzi- another Northwest rapper who loves pho.